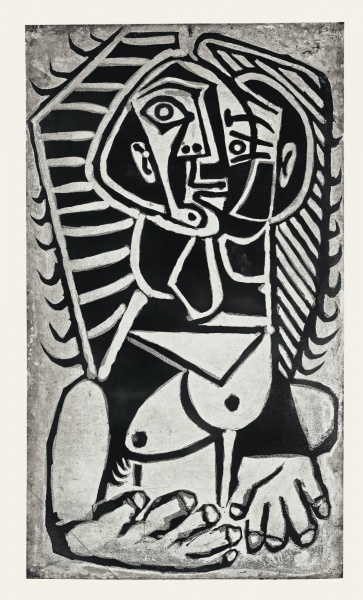 One of only three impressions printed by Crommelynck in 1979, Torse de femme, or L’Egyptienne, as dubbed by the Lacourière workshop, is a monumental portrait of one of Pablo Picasso’s lovers and muses, as well as mother of his two children Claude and Paloma, Françoise Gilot (figure 1). Françoise, a young emerging artist at the time, was 21 when she met Picasso in 1943. Inspired by her youthful vitality and dedication to her art, as Brassaï described her in his book Conversations avec Picasso, Picasso’s spirits, low from the oppressive years of the Occupation, were revived. Her image would appear regularly in his art until 1953. Unlike other portraits Picasso did of Françoise during those ten years, this bust has been abstracted to a point where he portrays her facing different ways simultaneously with heavy geometric angles. He still features her characteristic large eyes, long nose, full lips, one rounded and one angled eyebrow, linking her to her previous depictions. Her full hair resembles an Egyptian Nemes headdress (figure 2), the striped cloth seen on the statuary, and in hieroglyphs, of ancient Egyptian pharaohs (hence the title from Lacourière). As with the typical Nemes headdress, Françoise’s ears are placed in front of the hair. The chiaroscuro lends the print a dramatic flair, as Picasso used the sugar-lift aquatint technique to create a dense, velvety black. Picasso, of course, had a deep admiration for and familiarity in Rembrandt’s inky etching tones, which can be seen in this epic print. Many of Picasso’s portraits of Françoise feature elements found in L’Egyptienne. In Woman in an Armchair (Françoise) (figure 3), Picasso took a lithograph modeled on her face and copied it onto the canvas, preserving the monotone palette and cubist architecture. This is echoed later on in L’Egyptienne’s own cubist structure, bold lines and large swaths of deep black. Her mismatched eyebrows are found in each portrait done of her; one rounded, while the other angled. This portrait is considered one of the most compelling and powerful in Picasso’s graphic oeuvre.